All are welcome to come to the Billy Graham Library as Mr. Graham lies in repose Monday and Tuesday. Find out more information about parking and hours. They just had to come. 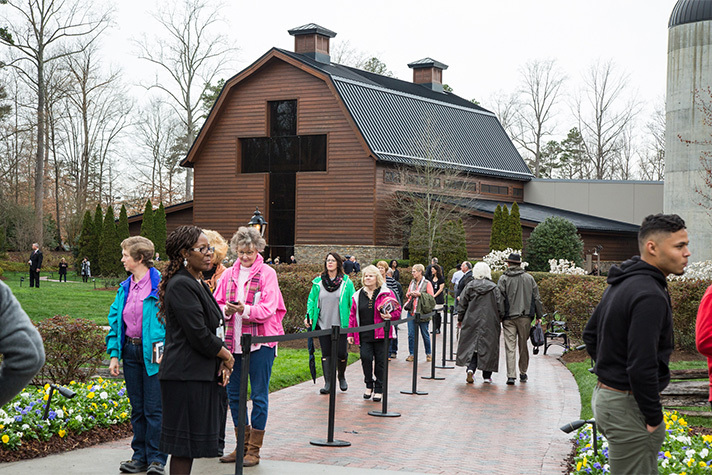 That’s what visitors who came to pay their last respects to Billy Graham kept saying Monday—one after the other. The beloved evangelist passed away on Wednesday, February 21, at his Montreat, North Carolina, home. He was 99. >> Read more details about Billy Graham’s memorial events, including lying in repose at the Billy Graham Library. 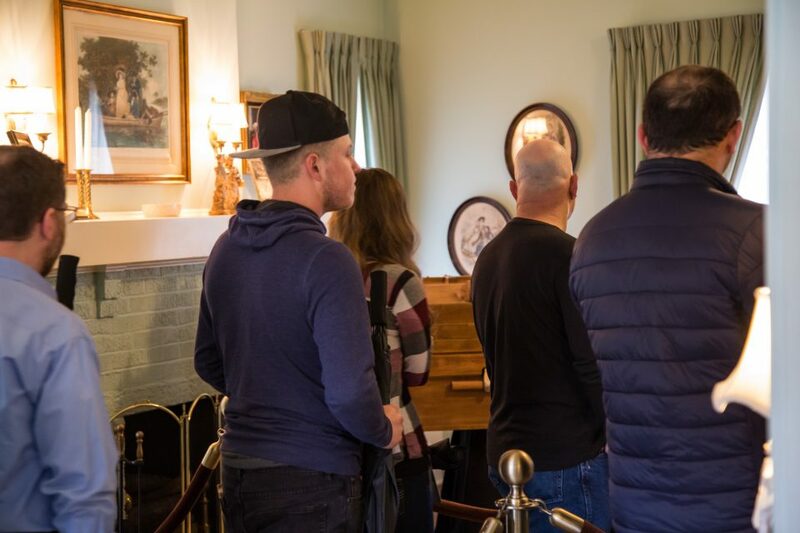 The public is welcome to come to the Billy Graham Library for one more day on Tuesday (Feb. 27) as Mr. Graham’s body lies in repose at the Graham Family Homeplace. 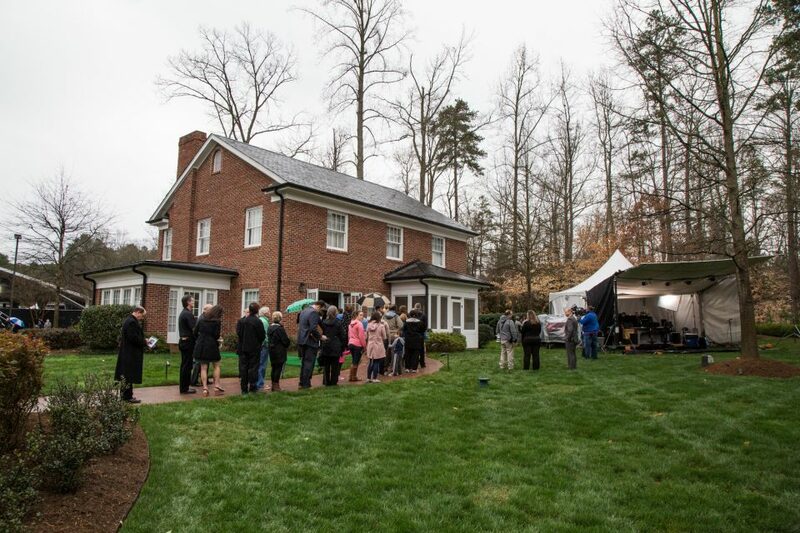 People stand in line outside the Graham Family Homeplace to pay their respects to Billy Graham. His childhood home was restored after being relocated from its original locale five miles away. When Darla Moll walked out from the Homeplace, she was visibly moved. “I just sat and prayed in front of him for about five or ten minutes—all the things I’m grateful for and grateful for him and confessed my sins again [to the Lord]. Moll’s father, who has since passed on, was saved at one of Mr. Graham’s Crusades in Detroit years ago. With his wife, they shared their faith with Darla and her 11 siblings. Mourners file by Mr. Graham’s casket inside the Graham Family Homeplace. One of 12 children, Moll’s been in church all her life but only recently accepted Christ. “I’m working on my journey,” she affirmed. 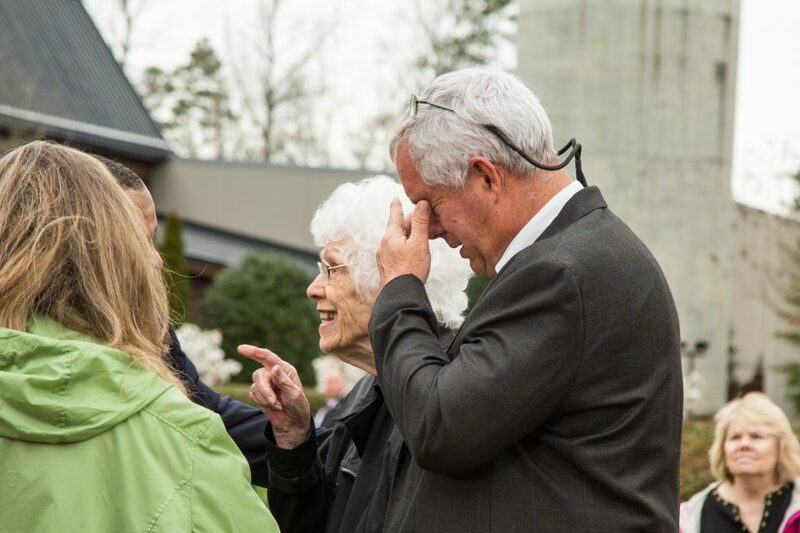 Roy Graham, one of Billy Graham’s grandsons, who works at the BGEA, was inside the Homeplace thanking people and telling them how he appreciates their love for his family. Dave Ballard holds back tears after walking past the casket holding Billy Graham. His mom, Jody, knew Billy Graham’s mom and dad. Jody Ballard had a special connection to the Graham family. Her late husband was pastor to Billy Graham’s mother, Morrow Graham, at Charlotte’s Calvary Church. She’d been inside the Graham Family Homeplace before—to visit the Grahams when they lived there many years ago. “It just brings back so many memories … lots of happy memories,” she said. Her son, Dave Ballard, had tears in his eyes. “There’s a void and there’s grief,” he said. “I’ve always thought that he was anointed in a very special way. 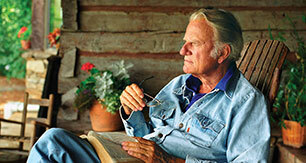 Billy Graham was an apostle. He spoke the Gospel to millions, and eloquently, faithfully. Billy Graham’s funeral is at noon on Friday at the Billy Graham Library. While the funeral is private, you can watch live coverage here, beginning at 10 a.m.
Are you sure you’ll go to Heaven? You can know for sure.